This paper catches the eye with its unusual orange, grey, and dark green color scheme and unusual imagery. The paper seems to contain two very distinct vignettes. In the upper part of the paper, there is a genre scene of a peasant woman and a barn on stilts beside a brook. There are numerous picturesque elements, such as the waterfall at the right edge of the brook, the fashionable dress of the woman, and the sleeping sheep and birds in the barn. The little landscape seems to float, supported lightly by tree branches that frame the vignette below. This vignette features two flying ships, one with wings and the other with a wheel of ostrich feathers, seemingly caught in a battle. Each ship is controlled by a figure holding onto the rigging of the ships while another figure stands on the prow battling with a spear and shield. Each figure in this lower scene seems to wear a different costume, but the one worn by the spear bearer on the left ship seems reminiscent of Chinese costume. His presence would have made this paper appealing for any fan of chinoiserie, or “Chinese style” design. Meanwhile the upper scene appeals to an entirely different 18th-century obsession, the obsession with idyllic rustic scenes. 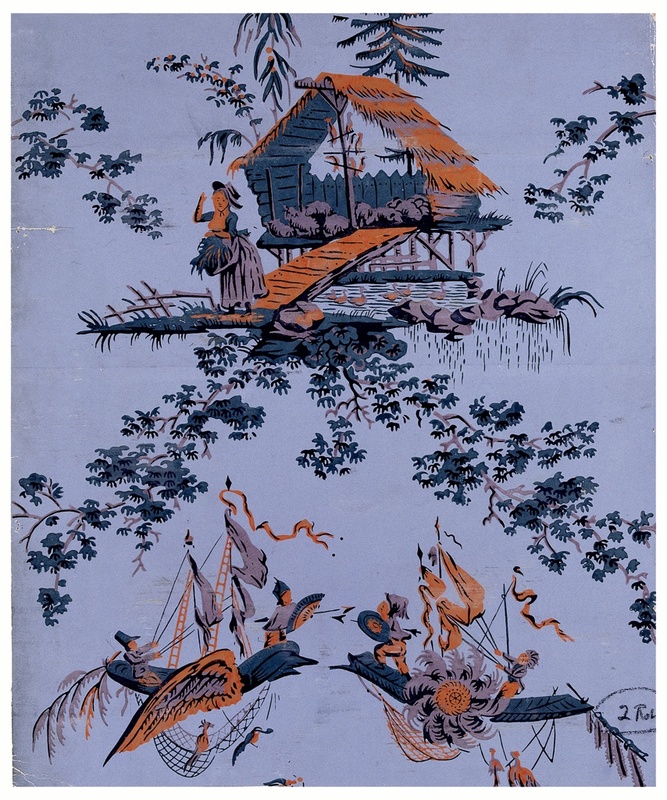 Both chinoiserie and the fad for images of country life spoke to an 18th-century obsession for escapist fantasies. Marie Antoinette famously had a little fake village built for her near the palace of Petit Trianon, where she could pretend to be a rural milkmaid living a life far from the confines of the court. Idyllic cottages could be found all over France in elite private gardens. Sometimes accompanying them would be tearooms in the shape of pagodas or Chinese tents where nobles could retire and imagine themselves living an exotic lifestyle free from the constrictions of high-class society. Chinoiserie and rural-style interiors served an elite class obsessed with personal indulgence and new fantastical sites for private leisure activities. The designer and manufacturer of this wallpaper, Jean-Baptiste Réveillon, was a powerhouse in the industry who served many of these elite nobles, including Marie Antoinette. His success was such that he was able to buy a mansion that came with its own park and private theater, and he also produced the papers that decorated the first hot air balloons. His career came to an abrupt end during the Revolution, when his mansion and manufactory were destroyed by rioters.